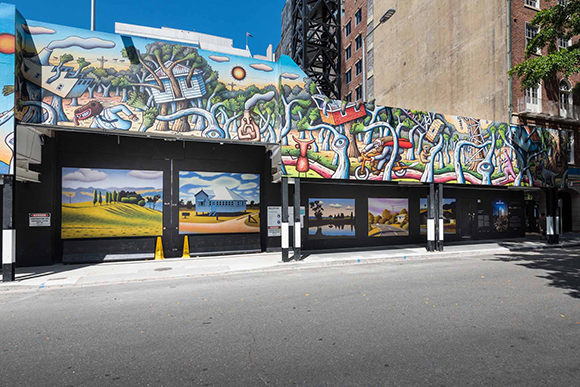 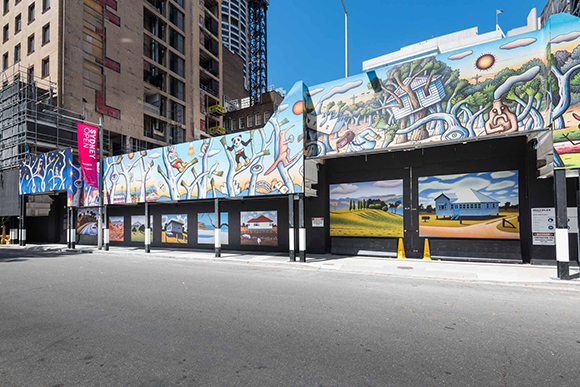 The site of Wynyard Place at 10 Carrington Street was adorned with a notable selection of works from one of Australia’s most recognisable artists – Chris O’Doherty (aka Reg Mombassa). 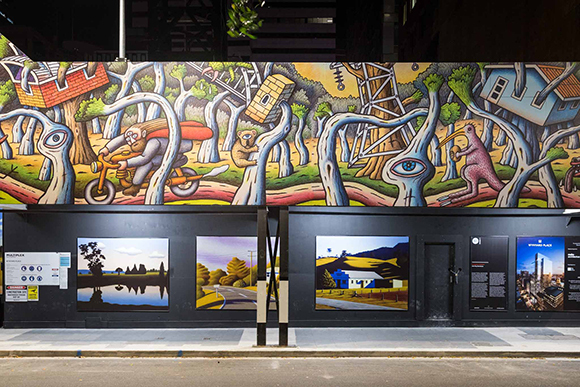 His ‘Hills, Houses, Roads and Water’ series – which evoke a sense of nostalgia and entice viewers to travel to the areas of New South Wales depicted – were displayed on the ground level of the site, in a gallery-style arrangement. 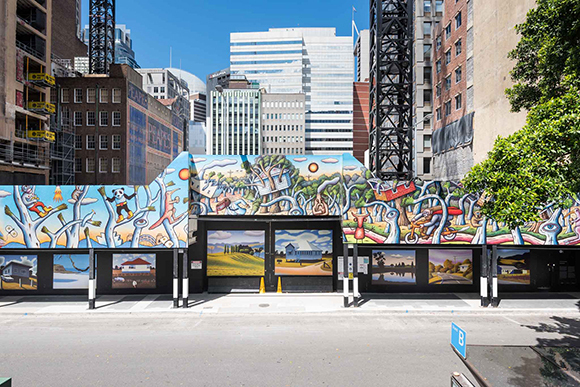 Above these 11 artworks, on the facia overlooking the busy Wynyard Place bus stop, a large-scale continuous mural featured a cast of Chris’s recognisably bizarre and semi-abstract characters in a dream-like scene. 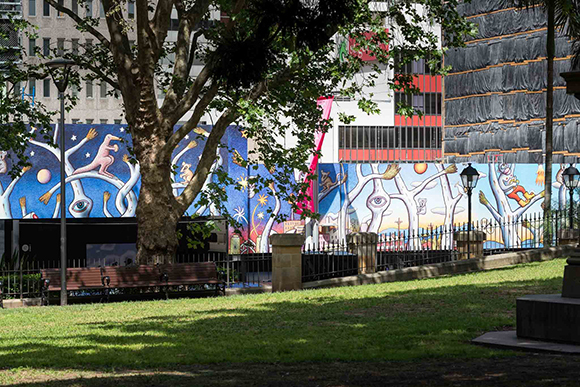 This creative placemaking project was designed to serve up the perfect mix of escapism, entertainment and humour for the thousands of city workers, tourists and residents who come and go from the area each day, and enliven the precinct during its revitalisation. 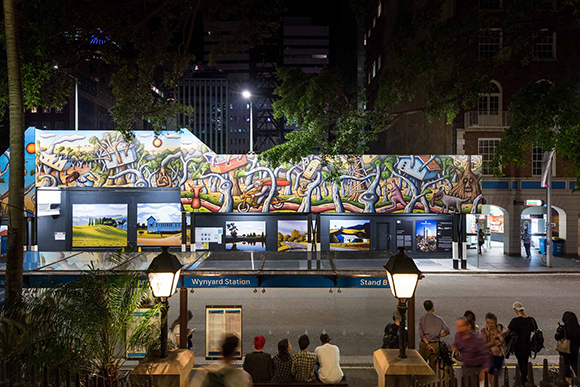 It was brought to the people of Sydney by Arts Brookfield and was curated and produced by aMBUSH Gallery (an initiative of Wiltshire + Dimas Management).